Catch the public prelude to Motorclassica on Thursday 23rd October with the traditional Tour Classica - the official opening of the event. Around 80 rare, collectible and historically significant cars and motorcycles will commence at the Royal Melbourne Zoo en route to the Royal Exhibition Building, Carlton. Although it's the fifth running of Tour Classica, it's the first time the cavalcade has started from Melbourne Zoo. Where and when: Beginning at the vintage carousel inside the Zoo, the tour cars and motorcycles will leave approx 9:30am and proceed along Royal Parade, turning left onto Grattan St, then heading towards the Rathdowne St entrance of the Royal Exhibition Building. Movember: In recognition of Movember as the official charity partner of Motorclassica, the tour will be led by three Movember-branded MINIs. Motorclassica is open to the public. Australia's premier exhibition of unique, collectable and historically significant cars and motorcycles, plus automotive memorabilia, models and collectables and auto art. Maserati will be honoured with a selected display to represent its race and road history, including rare vehicles like this 3500GT (pictured). Other road cars include a Mistral and Sebring, plus from the 70s - a Ghibli SS, Indy, Bora and a Khamsin. Modern era Maseratis will include a Quattroporte luxury sedan and the new Ghibli sedan - the marque's first model to be offered with an optional diesel engine. Maserati's racing history will also be represented, including a 1956 150S/250S sports racer, the 1957 Cameron Millar Special 250F Sports Monoposto, and a 1960 Tipo 61 Birdcage recreation. Plus a rare - one of 17 - 1992 Barchetta sports racer. Ford's iconic Mustang will be celebrated with a special display. Event director, Paul Mathers, says, "At Motorclassica we're featuring the landmark models from the very earliest and original Mustang to the most sought-after and valuable, like the Boss 302, 429 and a Shelby GT-500KR." Rarest of all will be a 2007 Shelby Mustang 'Fender', one of only two in the world. In a tribute to the early days of Australian motorsport, there will be a number of unique racing vehicles from the 40s and 50s. Event director, Paul Mathers, says, "Think Bathurst and you think Touring cars, but these machines are nothing like what you imagine today...back in those early days of the sport in this country, there was more enthusiasm than money, so it was perfectly normal for drivers to build their own racing car out of whatever they could lay there hands on." A tribute to Donald Campbell, the first and only person to set the World Land Speed Record and the World Water Speed Record in the same year, in 1964. Special guest and Motorclassica's 2014 Ambassador, Gina Campbell will present a special display of artefacts and memorabilia as part of a tribute to her father's world-breaking efforts in Bluebird. Gina is herself a World Water Speed Record holder in her own right. Automotive heritage brands Mercedes-Benz, Jaguar, Maserati, Alfa Romeo, Aston Martin and Lotus will showcase their contemporary models. - Mercedes-Benz will preview its all-new S-Class Coupe at this year's Motorclassica, well before the model's 2015 February launch. - Jaguar will display the F-Type R Coupe, its most powerful production model ever. - Lotus' Exige S - in both open-top and hardtop, plus the Elise and Elise S Club Racer. - Aston Martin's new Vanquish and V8 Vantage. 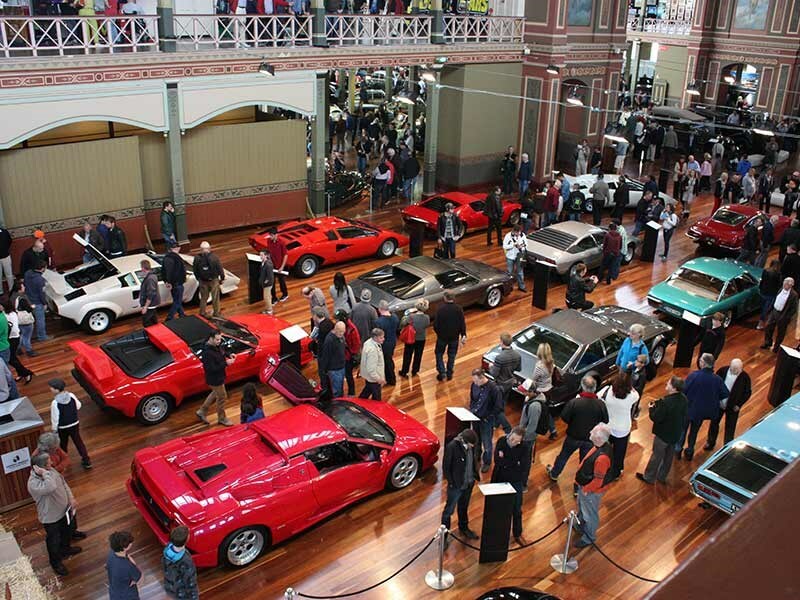 Over 150 cars and motorbikes will be competing for the top prize in the Australian International Concours d'Elegance. One of only two Australian events nominated in the prestigious International Historic Motoring Awards, the event brings extraordinary, rare, desirable and valuable collector cars and motorcycles from around the country and the world to compete in a variety of show classes, plus the coveted 'Best in Show' award. For the second year running, Theodore Bruce, Australia's oldest auction house, will present 30 individually selected collectable cars and 60 lots of memorabilia to go under the hammer. Rarities include a RHD 1954 BMW 503 Cabriolet with a $200,000-plus estimate and a 1956 Porsche Speedster estimated at over $250,000. The Theodore Bruce Collector Car auction takes place at Motorclassica from 6:00pm Saturday. Almost 400 club cars and motorcycles take part in the 'Club Sandwich', presented by Lorbek Luxury Cars, across the Museum Plaza on the Saturday and Sunday. Best Club Display and Best Presented Car awards will be presented by VicRoads Custom Plates. Interact with fellow enthusiasts and owners and get involved with the cars, the motorcycles and the clubs. Visit the website for days and times for the many clubs here. Motorclassica welcomes six top Australian artists along with an eclectic collection of vintage advertising from Demigod Antiques. New, established and emerging artists will be showcasing and selling their work, so come and meet them and possibly even commission your own car artwork. There will also be a special display of operational model engines from The Gary Grant Collection, plus bespoke jewellery, giftware, antiques and more. View other feature times here. Plus, every ticket purchased online goes in the draw to win a BRM V6-44 Hybrid watch, valued at almost $4,899. Full details here.